With reference cited above, I Mrs. Adi Lakshmi, my husband Mr. Lenin B.Yadla and my daughter Ms. Phani Geeta Priyadarsini, residents of Sri Sailam A.P., bring the following to your kind notice with a request to solve our problem immediately. As the Srisailam Devasthanam cancelled my room allotment, we met E.O. 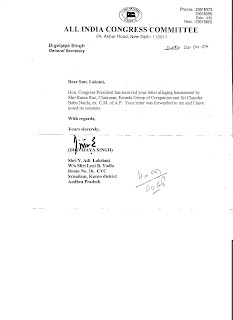 Mr. Hari Jawaharlal on 29-03-`07 with a requisition to recall the cancellation dated 27-03-`07, but he regretted it. Following it as a group of 20 members of my students` parents, we met D.E.O. Mr. Krishnayya [I narrated the entire rupture reg. this in my letter dated 08-04-`07 to you.] and E.O. on 31-03-`07, with a requisition to give 8 weeks time to vacate. The E.O. had agreed to give us up to May 8th 2007 i.e. 5 weeks extension, so that we are on necessary work to vacate our room and I requested you to help on this matter of an allotment. But on 11-04-`07, the D.E.O. again issued orders to us to vacate the room immediately. He is saying that they didn`t receive any further information regarding extension of time to vacate the room from E.O., so that they are persuing the old rejected request. When we remind them about their own commitment of time extension, D.E.O. Mr.Krishnayya sent his staff Mr. Ravi kumar and Mr. Swami with a message that they are going to handover the room and they sticked the notice on my room door. By stopping it with the help of oral request of my students` parents on 12-04-`07, I`m bringing the entire matter to your notice and I enclose the copy of evection orders for your ready reference. When their staff represented on 10-03-`07, within a couple of days, they had looked into the matter, taken decision to cancel my room and issued orders to me, on 13-03-`07. Their administration is that much fast, if it is infavor to me. On the other hand, they didn`t receive my requisition on which they committed for time extension, from 31-03-`07 to 11-04-`07, for about 10 days; because it is favor to me. Is it redtapisam or harassment? What is such need for the D.E.O. etc. employees to hunt me like this? Whose support is there to him to do this? In this Srisailam village, entire land, cottages, rooms belong to Devasthanam and several retired employees, suspended employees and transferred employees are residing since years of long time in cottages and rooms as more than 100 in numbers. And private people like us also there in more than 100 in number. Leaving all these, they required my single room only, so that they are evicting it wantedly. The sub ordinate of D.E.O. i.e. C2 clerk Mr. Madhusudhana Reddy spreading different rumors on this issue on day by day. When our student`s parent Mr. Sudhakar[Police Constable] enquired him on 11-04-`07 about this time extension of room, he said that the E.O. didn`t put initial on our representation dated 31-03-`07 which I enclosed for your ready reference to my letter to you dated 08-04-`07. When another parent Mr.Ganapathi enquired him regarding same to help us, Mr. Reddy said that the file was missed somewhere so that they reacted on previous rejection. To another parent he said that the E.O. didn`t send it to them and E.O. kept it in his table drawer. On 26-03-`07, Mr. Madhusudhana Reddy told another parent named Mr.Rajasekhara Reddy that we had compromised with them [with whom, we surprised] and written some commitments so that the room cancellation was recalled. Like this, he is playing psychologically on us. What is his need to do so, he might know. The E.O. had given commitment to us[as a group of parents] for time extension up to 08-05-`07 and again they are overlooking it and issuing evection orders within 10 days. Like this, they are harassing us as if we are wild animals. By showing patriotic responsibility towards Nation, did we become wild animals or mild animals? Are we eligible to face such hunting on us? Mam, at this juncture we request you’re good self for allotment of accommodation to us at Sri Sailam, help us, and protect us from this harassment. Encl: Copy of evection order to vacate the room; by Devasthanam. Note: The matter is brought to the notice of President of India, Prime Minister of India on the same date.